It has been said that the gift of time is the greatest gift we can give. If so, then teachers are among the world's greatest givers. May 9th is National Teachers Day. The art of Jim Daly is one of the nicest ways of remembering and saying thank you. "We all remember a teacher from our childhood who gave us the gift of time and helped us when we needed it. As the years go by, we think of them and become aware of the precious gift the gave us. We feel an emptiness inside because we want these teachers to know that they made a difference and that they affected our lives forever. But we never told them. My painting, A Gift of Time, is dedicated to all teachers who have given such a gift - my way of saying, 'Thank you, thank you, thank you." 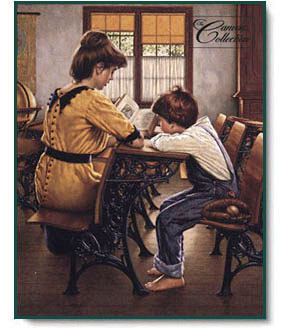 A Gift of Time copyright © 1995 by Jim Daly.